What do Mary, Queen of Scots; Napoleon; Abraham Lincoln; Mark Twain; and Fast Eddie from the 1961 film "The Hustler" all have in common? They all played forms of pool. The game, defined by the practice of using a cue to hit a striker ball into other balls, originated in 15th-century Europe, and exists in many different variations. While top players practice for hours every day and can earn six-figure salaries, you can enjoy a casual game at home or in a pool hall even if you aren't an expert. When elegantly dressed gentlemen in British television series such as "Downton Abbey" retire after dinner to play a game that looks somewhat like pool, it's not actually pool; it's billiards, a game that does not involve sinking balls in pockets but rather striking them against railings and other balls. Another cue sport, snooker, was invented by British soldiers in India, and is played on a slightly larger table than pool, using more balls. Genuine pool, sometimes called "pocket billiards," uses a distinctive 9-by-4.5-foot table with pockets in the four corners and a side pocket at the middle of each of the two long sides. The vernacular phrase "behind the eight ball," meaning in a bad position, originates from the classic pool game of "eight ball." This game is played with 15 numbered balls, seven solid and seven striped, and a black eight ball, initially assembled in a triangular rack. The object of the game is to sink all seven balls of your type, then the eight ball. If you accidentally sink the eight ball while one of your other balls is still out on the table, you lose. All shots must be called; in other words, you need to say which ball you are shooting into which pocket for the shot to count. 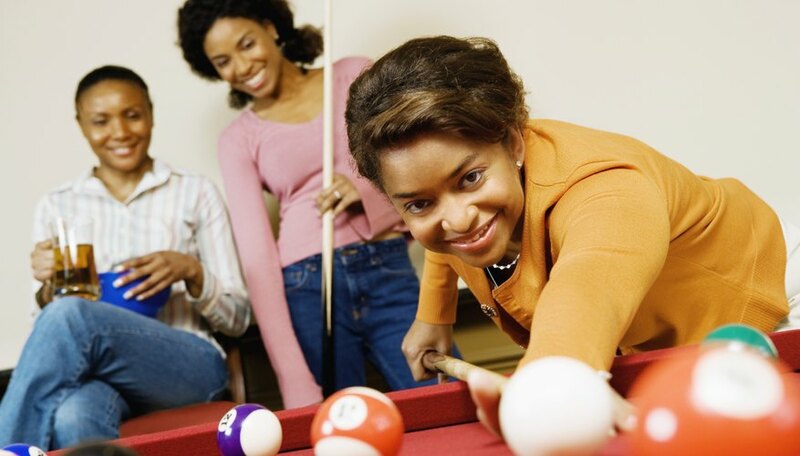 Eight ball is featured in most pool tournaments due to the high skill required in making called shots. Black ball is eight ball made easy. The main difference is that you do not need to call your shots in black ball. You can send your target ball careening wildly around the table, and if it lands in any random pocket it still counts. This variant on eight ball is popular for casual or friendly pool, or family gatherings. Straight pool uses 15 balls, starting in a triangular rack. To score, you can choose to sink any ball in any pocket, but you must call your shot, by specifying, for example, 12 ball in the corner pocket. You are awarded one point for each ball you sink. The player who has the highest score when the table is cleared wins. For a longer game, when only one ball remains on the table, you can re-rack all the balls and keep on playing until an agreed-upon score, such as 150 points, is reached. The game of nine ball uses nine sequentially numbered balls starting in a diamond-shaped rack. The balls must be pocketed in order, using called shots. The player who successfully pockets the nine ball wins.